On DSiWare, G-Style's Jump Trials games followed in the fleet footsteps of 10 Second Run, providing short bursts of one-track, one-button gameplay with no fuss and few frills; if Super Mario Bros. is an epic platforming poem, Jump Trials is a list of words that rhyme with "cat". There's certainly a place for the simpler things in life, however, as the series' latest 3DS eShop release proves. Jump Trials Supreme is a straightforward, fun, and challenging precision-platformer, and a welcome evolution of the series. The main objective of Jump Trials Supreme is as simple as it gets: run, jump, and reach the end of a bite-sized course, all in under ten seconds. You'll guide your off-brand Mr. Game & Watch - apparently named Mr. J, and admittedly looking quite a bit better than in his DSiWare days - over moving and disappearing platforms, see-saws, spikes, springs, conveyor belts, ice blocks, and all sorts of other obstacles on his journey across the screen. Precision, skill, and speed are the name of the game; you'll have to move quickly and nail every jump to make it to the goal on time. 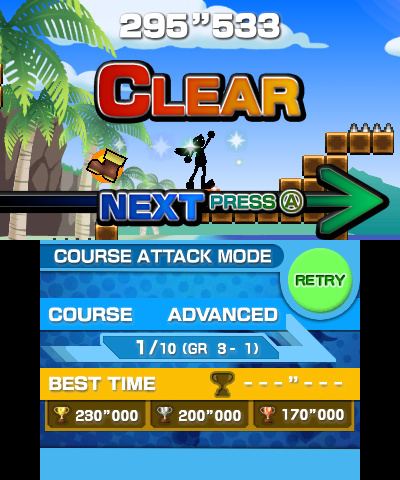 The emphasis on perfect platforming makes for an awful lot of failure, but since there aren't any lives or Game Over screens to worry about, and restarts are automatic and nearly instant, the frustration level stays as low as possible; finally beating a tough stage feels like an accomplishment rather than a relief. It also helps that Mr. J controls rather well - movement (with either the Circle or D-Pad) is tight and responsive, and jumping (with 'A') feels nice and nimble, with longer or shorter presses yielding higher or lower hops, respectively. The biggest tweak to the formula this time around is the addition of a double jump. It sounds like a small change, but in the series' brand of exacting platforming it definitely makes a difference. Certain gaps and obstacles are built around the ability, and require two expertly-timed taps to clear, but everywhere else, being able to catch yourself with an extra jump adds some room for error in an otherwise incredibly unforgiving game. These spectacular last-second saves are lots of fun, and they also feed into one of the coolest new additions to the game: the floating Jump Recovery Pads. Each time you touch a Jump Pad mid-air, you'll be able to take an additional jump. This essentially allows you to leap indefinitely within the Jump Pads' airy embrace, and there are some fantastic mid-air platforming sections built around the mechanic. The other new environmental additions - fans and electric shocks - join returning set-pieces and pitfalls in 100 well-designed stages, divided up into ten grades of ten levels apiece. As in the previous games, you'll need to tackle each grade sequentially in Trials Mode before unlocking the next. Here, the objective is simply to hit the goal buzzer before your ten seconds are up, with bronze, silver, and gold medals awarded based on your time. 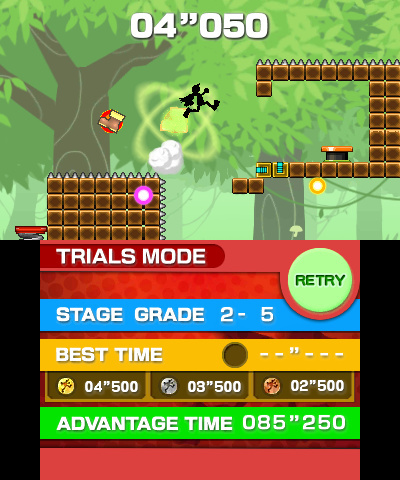 There are difficult jumps and plenty of obstacles, but with a generous helping of practice runs (made easy thanks to an instant "Restart" button on the touch screen) most players should be able to make their way through Trials Mode without too much trouble. Once you've beaten a particular grade in Trials, however, those same levels will become available in Challenge Mode, and it's here that Jump Trials game really comes into its own. 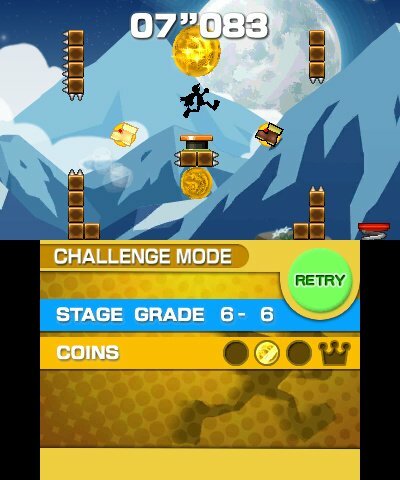 In this aptly named mode, you'll need to collect three coins before reaching the goal - still within ten seconds, mind - and these coins are inevitably placed well out of the way; reaching them often requires death-defying manoeuvres that shun self-preservation in the name of gold-medal perfection. It's frantic, fun, and very demanding platforming - speed runners and anyone looking for a real challenge will have a blast. The problem - and it's one that's been with the series from the start - is that Jump Trials' stages seem to have been designed exclusively with Challenge Mode in mind. In Trials Mode, it's not unusual to find levels where every tricky jump is completely optional, and getting to the goal is just a matter of walking to the right and hopping on. These stages will invariably have deviously placed coins the next time you see them, in Challenge Mode, but when there aren't any coins to collect, what's the point of simply waltzing through in Trials? The effect is that Trials Mode ends up feeling like an extended "warm-up" to the actual game, and one with an incredibly erratic difficulty curve, where finger-twisting tests of skill are sometimes followed by rote exercises in rightward motion. A third mode - Course Attack - is a new addition for Supreme, replacing the individual stage Time Attack from Jump Trials Extreme with speed runs through three sets of ten levels apiece. Instead of a ten second time-limit per level, you'll be racing against a single timer counting down from 300 seconds; missing jumps or falling back to earth after a vertical climb will cost you precious seconds on the overall time, and since you won't have the luxury of restarting a stage if you can't cut it in under ten, repeated mistakes can add up quickly. At the end of the tenth stage, the remaining time on the clock serves as your score - the higher the better. 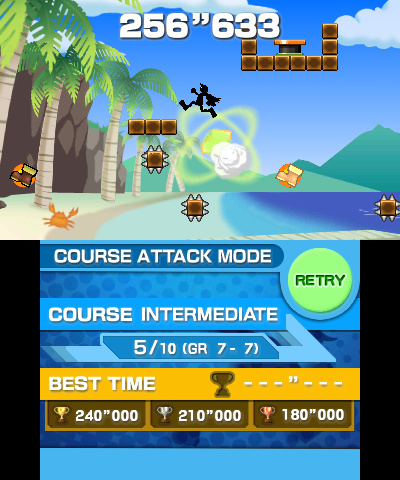 Course Attack is a novel way to track your times, but in some ways it's more limited than the Time Attack Mode in the previous game. It only includes thirty stages, for one, and they're cherry picked from different grades to make up sets without any obvious connecting thread. Running through the courses is good fun, but we can't help but think it would have made a better complement to Time Attack rather than an outright replacement. Still, Course Attack brings a welcome first for the series: you can upload your best times to online leaderboards, with worldwide rankings for each difficulty level. You'll also be able to see how your progress in Trials Mode measures up by your Advantage Time ranking, which tallies up the total remaining time on the clock from all the stages you've cleared so far. Updating your times is simple and speedy, and you can compare your scores with the fifty closet players in ranking, as well as marvel at the impossibly fast times of the top fifty players worldwide. Online leaderboards will definitely be a bright spot for competitive players, but that's not the end of Jump Trials Supreme's online features; by enabling SpotPass, you'll be able to receive additional levels and challenges over WiFi as they become available. At the time of writing, that includes two Challenge Mode stages in an appropriately-named "Master" grade, both of which are ludicrously difficult and provide a nice post-game challenge for the more adroit among us. It's exciting to see a smaller developer taking advantage of SpotPass, and if G-Style continues to add new levels via SpotPass, as we hope will be the case - and it looks like there are at least 10 "Master" stages to look forward to - it could significantly extend the life of the title. Jump Trials is the kind of game that's perfect to pick up and play every once in a while, and new content being pushed over SpotPass provides an excellent incentive to jump back in. Jump Trials wasn't exactly known for its good looks on DSiWare, and the series' tradition of humble homeliness continues on the 3DS as well. The art is a definite upgrade from the first two games, but the heavily-tiled assets and generic style still give the game an unfortunate "phoned-in" look that doesn't live up to the rest of the experience. The stereoscopic 3D effect is used well, however, and the multi-layered, subtly animated backgrounds are a vast improvement - even if there are only a few of them. The interface deserves a special mention, too; menus are stylish, colourful, clean, and admirably snappy. You might think a game with ten-second levels wouldn't be able to pack much in the way of melody in-between the menus, and you'd be right - but the music that is here is supremely catchy, and since the gameplay encourages playing in short bursts, it never outstays its welcome. Funky, futuristic jazz floats behind the Trials and Challenge modes, while Course Attack comes with a smooth club track of reverb-soaked horns and steady bass that thankfully continues through the whole 300 seconds rather than restarting at every stage. 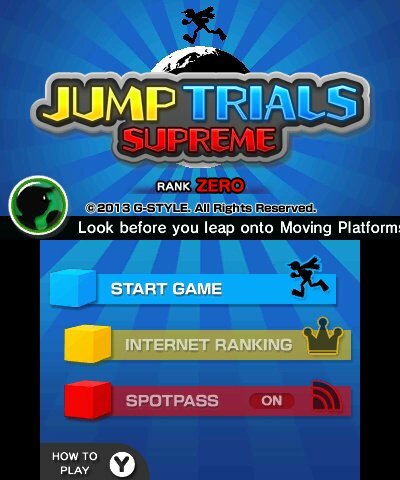 Jump Trials Supreme may not be much to look at, but don't let its generic aesthetic put you off - this is a fun and challenging eShop release that distills platforming down to its essence and serves it up in ten-second shots, with some commendable online extras on the side. Fans of the DSiWare games will definitely enjoy the upgrades, and if Jump Trials' take on high-speed, high-stakes platforming sounds like your cup of tea, this is the best place to jump in. The concept definitely appeals to me. Will download it if it ever makes it to New. Zealand! I'll give you 9/10 for the review, even if just for the Van Halen reference. Looks fun, would pick it up if it was for sale in Australia. I just played the demo that came out on the Japanese E-shop last month. I wasn't impressed. I actually preferred Jump Trials Extreme to the seemingly more popular 10 Second Run, so to hear that this improves upon the previous entries in the series makes me more interested. I'll pick it up eventually. Looks a little boring to me and completely unoriginal at this point. I'll pass. those G-Style games on 3ds eshop are fantastic. I bought the five of them (alien on the run, crazy construction, extreme run, zombie bowling and chain blaster) and the quality is there !